The original Green Point Stadium seated 18,000 people, and this multi-purpose stadium was once one of the most attended stadiums. The main purpose of Green Point was to host football matches while it was also the home ground to the Ajax Cape Town team as well as the Santos Football Club at different time-periods. It was used to host the concerts of several international stars such as Metallica, Robbie Williams, Janet Jackson, Def Leppard, U2, Michael Jackson, Paul Simon and Gloria Estefan. This is also where the 46664 concerts were hosted in benefit of the victims of AIDS. The Green Point stadium was often used by the local schools in de Kuilen, Ellerton, the CBC and Sea Point High School for annual inter-school athletics. In 2007 many had to say farewell to the Green Point Stadium as it was demolished in part to make space for the much larger Cape Town Stadium in preparation of the 2010 FIFA World Cup. The section that remained now forms the basis of the new stadium, which is built on top of the previous main stand. The new stadium enhances and complements the thriving downtown of Cape Town and is near both the entertainment and shopping district of the V&A Waterfront. During the construction, it already became clear that the stadium will remain known as the Green Point Stadium even though it was demolished to make space for a newer and much larger stadium. It got so confusing that the City of Cape Town asked the public to propose names for the new stadium, a very small majority voted the name as the Cape Town Stadium in, although for the rest of South Africans it remains the Green Point Stadium. The new Green Point stadium is not based in the centre of the city, which sort of isolates it from the busy hustle and bustle of the city itself. It was selected to host five of the first round matches during the month-long World Cup in 2010. These matches included a second-round match, single semi-final match and a quarter-final match. 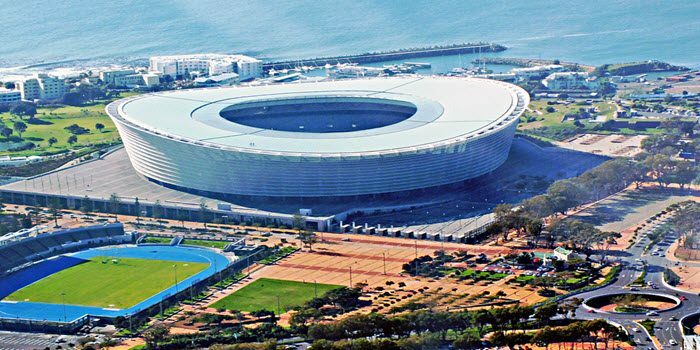 The highlight though was the first opening match between France and Uruguay on the 11th of June 2010.
he New Green Point or Cape Town Stadium hosts 55,000 spectators and opened on the 14th of December 2009 after construction worth $600 million was completed. The new stadium has many names in Xhosa it is called Inkundla Yezemidlalo YaseKapa, for many, it is simply known as the New Green Point Stadium and Afrikaners call it the Kaapstad Stadion. What makes its name even more challenging to change is the fact that it is located in the suburb called Green Point, which means it would probably remain the New Green Point Stadium for many years to come.